Enough Work to Go Around? In the freelance-editing field, the topic persistently arises of whether to share client lists with other editors. New editors looking for a way into the industry hope that some nice, established editor will put them in touch with the right people. Some new freelancers might even expect this, seeming to not understand exactly what they are asking. Conversely, established editors want to protect what they have earned with their years of experience and may be reluctant to share contacts with just anybody. Should new freelancers expect a helping hand from the veterans among us? And just how important is it to guard your client list once you have built it? Most of us received some amount of help in getting where we are. I know I did—a lot of help—and so, from the beginning of my career, I have tried to give back. Often that has meant sharing my knowledge of the industry with those looking to break in. Other times, it has meant sharing clients. Several years ago, I said as much to a fellow freelancer, someone I considered a mentor. She said, “I don’t understand that saying. Give back what?” She felt she never was given anything she needed to return. As fate would have it, a few years later, her main client had dried up and she called me looking for a way to keep her business going. She had taught me plenty about editing; I was ready to do whatever I could. To start, I put her in touch with one of my clients who I knew was looking for editors. She never followed up. Perhaps not surprisingly, her freelance company is no longer. What did I learn from this experience? This woman, who felt she had never been given anything she did not earn, was unable to see the gifts she had received. She acknowledged neither the training and education provided by her capable teachers nor the job opportunities and support her colleagues had given her. And she ended up with nothing. I adopted the opposite stance, and my business is stronger than ever. I have also received calls from experienced editors who are just branching out into the freelance world. Those who are polite, respect my time, and understand that any contact information I share is given because I trust them, I am happy to put in touch with a few clients. Like many others, I have clients with more work than editors, and it doesn’t hurt me to share that information. In the cases when I am the beneficiary of someone else’s client contact information, I say thank you. Then I not only follow up, but also provide excellent service for that client. I know my actions reflect on the person who made the connection and I will not let them down. To be clear, I do not advocate giving away your client list to every new editor or freelancer who asks for it. As noted, the established editor may be putting his or her reputation on the line when referring a new editor to a client. Therefore, you have to know something about and have a certain amount of trust in the other freelancer’s abilities and character. So, what do you do when the asking editor does not meet your standards for referrals? In lieu of giving away contacts, consider educating the person about how you found and have held on to the clients you have. Although one can gain a gig based on a referral, maintaining the client demands high-quality work. At times, new freelancers need to be reminded of that. Some established editors don’t only begrudge giving away their contacts. They also do not wish to give away their time, especially to those who are just dipping a toe in the water. I (and many others) enjoy educating new editors about publishing. Many people did the same for me when I was coming up, and I feel I owe it to the universe to share what I have been given. That said, these “young whippersnappers” can be the worst offenders in assuming that veteran freelancers should willingly give away their contact lists. More often, I have found they are well-meaning and simply need to be told what they can rightly expect. Although it may feel as if you are wasting your time when you spend 30 minutes talking to a “newbie” about how to break in, consider it an investment in your future. Freelance work often fluctuates, but if you take the time to help others, you will have a network of people ready to assist you when you need it. Helping the next generation can take many forms, such as sharing knowledge, time, or clients. Next time some new freelancer asks you for a helping hand, I hope that you will remember the support you received and send that back out into the world. None of us has gotten where we are all on our own. And in this world of blogs, journals, trade book publishers, corporations, nonprofits, packagers, textbook publishers, academic presses, and self-publishers, there really is enough work to go around. Today’s post is by Jordan Ring, a successful self-publisher who helps other indie authors reach their full potential. Here he offers some excellent, down-to-earth advice on how you can sell more books and achieve your goals. My thanks to Jordan for sharing his thoughts with us. You have a book inside you. Every single person has a book in them that will impact other people. Most won’t start writing. Many of those who start won’t finish. Even fewer people will publish. You are better than that. Maybe the book is halfway done? Maybe it’s finished? Oh no, please don’t tell me you finished it two years ago but are still “tweaking” it! Maybe you feel like you will never get your book out there. Maybe you feel like even if you do, it won’t sell. Low sales numbers is the main fear of all authors, and I know because I have faced it myself. We are fearful that our book won’t sell or, even worse, it will get bad reviews. This can stop even the best authors from ever starting, and even better authors from putting their work out there. Don’t let this happen to you. The world deserves to read your book. Follow these three tips to push past fear and get your book published. Since getting zero sales is your biggest fear, set a target number of sales to reach for. I tell all new authors to shoot for 100 sales of your book right out of the gate. Would you be happy if 100 people read your book? As a new author, that is not an insignificant number. No, 100 sales is not going to pay for the book (in time or production costs), but it’s a realistic number that you can hit. Once you hit that number, set a second goal (e.g., 500 sales) and do everything you can to hit that. It’s of über importance for new authors to set a number to reach for. Without metrics, how can you measure success? This will enable you to appreciate the accomplishment, and it will bolster your resolve to publish your book. Marketing plan to finish your book? Yes, it makes sense. Stick with me. Finding success as an author means figuring out what is blocking you from moving forward. The reason most would-be authors don’t publish their books is that marketing seems like the giant mountain behind the already huge hill of actually writing a book. That’s why you should start working on a marketing plan from the get-go, when you are writing a book. This not only will give you a clearer picture of what you are actually writing, but will assuage your fear that the book won’t sell. How am I going to sell it? First, you must define your target audience. Your book is not for “everyone” and that answer is the fastest way to zero sales. Figure out who exactly would be interested in reading your book, and gameplan a way to get the book in front of those people. The best way to do this is to do research on Amazon and see which other books like yours are selling well and have good reviews. Second, you must have an intrinsic reason to write the book, in addition to the obvious extrinsic reason of getting book sales. If you don’t have a why, you won’t be able to push through and finish writing. And last, you need to at least have an idea of how you are going to sell your book. The most obvious and best answer is to use Amazon exclusively, but how else will you get your book in front of potential readers? The base of any marketing plan is to focus on having a great title, getting a professionally designed book cover, and writing a killer book description. I like to call these the Big 3 because you will not sell any books if these things aren’t of the highest quality. Your title and book cover bring people in, and your book description sales copy will sell them the book. It doesn’t matter how good the content under the cover is — if people aren’t brought in, they won’t buy. You can have the Big 3 professionally done for you, or you can learn to do them yourself, but regardless, you need to focus on them from the get-go. If you need more help making a marketing plan, touch base with us at Archangel Ink and we would be happy to help. Taking action is the number one most difficult thing to do in every endeavor. You are forced to sit down and write, plan, and work all while removing your fear of potential negative outcomes. I know that this can feel almost impossible at times, but taking action will bring you closer to your goals. You have to become fearless, and to be ready to pound away relentlessly on your laptop keys to get the job done. Don’t worry about what comes out of you, just keep writing and then get it edited later. Keep on writing and let the words flow. Turn off your internal editor. Set a schedule for yourself to write consistently, but also be sure to make time for planning marketing items. Utilize a website like Trello and make a board to plan and then track your writing, publishing, and marketing process. Continue taking action and before you know it, your published book will be arriving on your doorstep and on your e-reader. Good luck as you continue to write, publish, and ultimately sell your book. Follow these simple tips, and you will do well. P.S. I’d love to read your book when it’s done — send it on over to me. Jordan Ring is the marketing and launch guru with Archangel Ink Publishing Services. You can follow him on his blog, and for help with your own book launch you can get his free book here: Book Launch Gladiator: The Four Phase Approach to Kindle Book Marketing in 2018. In the blog series Publishing Stories, I asked several past clients to share their experiences with publishing. There are more to come, but I would like to pause here and think about what we as authors, editors, and publishers can learn from their stories. The four profiled authors — Gary Bargatze, W.K. Dwyer, Maureen C. Berry, and Peter C. Diamond — come from a variety of backgrounds, wrote on wide-ranging topics in both fiction and nonfiction, and were in varying stages of their careers as authors. Gary Bargatze, the author of the eight-book historical fiction series titled Your Winding Daybreak Ways, chose to hire his own editor and rely on a publishing services company to produce his book. Starting in 2015, five of the books have been released with more publishing over the course of 2017. W.K. Dwyer, whose social sci-fi novel The Killing Flower was just released in fall 2016, arranged all of the vendors — developmental editor, copyeditor, interior designer, cover artist, proofreader, printer, and e-book company — himself. Maureen C. Berry left a contract with a publishing house to self-publish her cookbook, Salmon from Market to Plate, on her own terms and schedule. The book debuted in 2016. Peter Diamond’s self-help book Amplify Your Career and Life published in 2014. He hired a developmental editor, then contracted with a hybrid publisher for production, distribution, and marketing. The goals of each author and their expectations for marketing and sales greatly colored their stories. It was educational for me to see where I saw success and where they did or did not. Gary Bargatze had a vision for his series before he wrote it, and he followed it through to the end of the project. He was aware of his abilities, crunched the numbers, and found the path that was economical for his time and pocketbook. His use of an editor outside of the publishing services company is one of the key decisions he made. It saved him money compared to what the publishing services company offered, and he received what I know to be a more in-depth edit than most get with a company. Gary also wasn’t shy. He stood up when the production wasn’t right, and he had his book reviewed in the Baltimore Sun online (twice, actually). He is strategic and pointed with each decision and the success he has had reflects that. The satisfaction he takes in the journey of publishing is also apparent — and deeply important to the final judgment of whether this adventure was a success. W.K. Dwyer shared how much he learned over the course of publishing his first novel, and one lesson is that self-publishing is a whole lot of work! There are a lot of moving parts, and it takes a lot of mind space to keep it all going. He wanted full control over production, especially in regards to the cover, and that is what he got. His book is beautiful and well crafted. Marketing, as he says, does not happen on its own, and while there is satisfaction in making a great product, it’s more fun when people buy the book. Delegating work can help to alleviate the stress. Indeed, W.K. has since enlisted the help of a marketing expert to get word out about his book. With that assistance, W.K. is set to meet his goals. Maureen C. Berry knew what she wanted: a traditional publisher who was going to support her book idea and her marketing efforts. When she discovered that wasn’t going to happen, she changed course. She produced the book on her own to her own standards, and she immersed herself into the marketing the book. More than any of the other authors profiled, Maureen has embraced the work of marketing her book. She has clear determination to give the book its best shot at selling, and it is selling! Maureen’s enthusiasm and drive are palpable, and it’s clear that she enjoys the challenges of marketing. Those two factors go a long way in whether marketing efforts will pay off. Her traditional publisher would have done well to keep her. Peter C. Diamond told us that he enjoyed the writing and publishing aspects of making a book. But like many authors, he underestimated the amount of work involved in marketing the book. Although he had some help with the marketing, he did not meet his sales goal. What I see with Peter, however, is a much bigger success than he may see. His book is both a self-help book that really does help the people who read it — note the 25 reviews on Amazon — and a marketing piece for his company. In this situation, there rarely is a one-to-one return on investment. But for many businesspeople, that’s not the point. Rather, the book offers intangible benefits in the form of new clients, prestige for the author, speaking engagements, and other business-related opportunities. Self-publishing is also very much about the long tail. That is jargon for the amount of time it takes to make back the investment. A traditional publisher will market a book for six months and reap as much profit from that endeavor as possible. That’s the short tail. Self-publishers have to take a longer view. In the coming months, more authors will share their stories, highlighting other aspects of the publishing life. Some do not see themselves as bearing a lesson, but I assure, there is much more to learn! Like this blog? 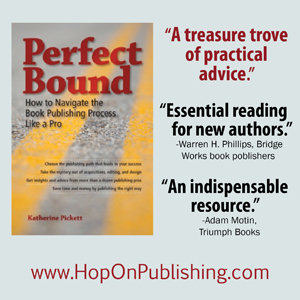 Find more advice and insights in the award-winning book Perfect Bound: How to Navigate the Book Publishing Process Like a Pro, available through Hop On Publishing, Amazon.com, Barnes and Noble, Novel Books, and other fine retailers.